I recently received a vegetable, looking like a big green beet with a thick skin. As I don't know what it is, I can't look for appropriate recipes on the internet. The Google reverse image search couldn't help either. As was mentioned, this is a kohlrabi. I felt more explanation should be given based on the fascinating nature of this plant. Brassica oleracea has been cultivated in many different parts of the world to appear almost like entirely unique plants. However, each of the listed plants are, in fact, the same species with slightly varying traits. Kohlrabi, for example, has been bred to have lateral growth in the meristem while broccoli has been bred to have a large, flowering head. 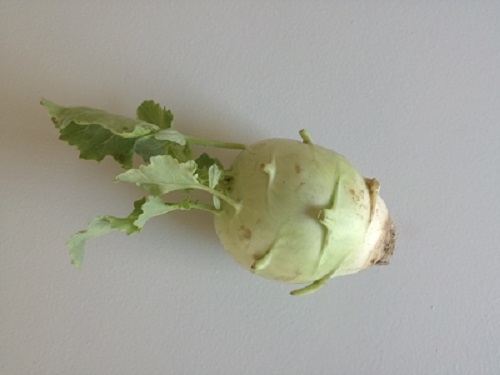 Kohlrabi can be eaten either cooked or raw. It's often used in salads and slaws, and can be interchanged with collard greens or kale. Kohlrabi. Basically a form of turnip. Not the answer you're looking for? Browse other questions tagged vegetables food-identification or ask your own question. What is this beanlike thing?